The ultra-violent film "The Man with the Iron Fists" does not hide the fact that it is an ode to those old Chinese martial arts of yore. Even the opening credit fonts and style harken back to that era. Unfortunately, the film tries to box everything up in that same old style without any 21st century flair and styling. What ends up is a film that is enjoyable on an action-based level but completely lackluster in almost everything else. If bloody guts abound is your thing then "The Man with the Iron Fists" mighty just be good enough for you but for everyone else, it's an easy pass. In 19th century China, Jungle Village is home to several warring clans. One of these clans are known as the Tiger Clan led by Gold Lion. When Gold Lion is asked by the Governor to give protection to his caravan of gold that must pass through the village. Unfortunately, Gold Lion is betrayed by his most trusted men, Silver Lion (Byron Mann) and Bronze Lion (Cung Le). They assassinate Gold Lion and are now awaiting the gold caravan to arrive. As word goes out to Zen Yi (Rick Yune) of his father's betrayal, he plans to go back to the village and seek revenge. This is no easy task as Silver Lion has prepared for his arrival with the special help of Brass Body (David Batista) - a man who can magically turn his body to metal when hit. Luckily, Zen Yi is helped by the village black smith (RZA) and the Governor's emissary, Mr. Knife (Russell Crowe) who must stop Silver Lion's plans. 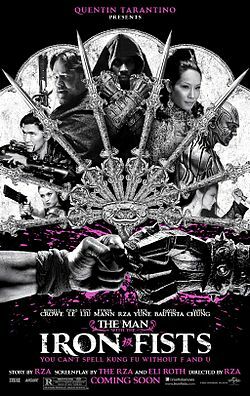 "The Man with the Iron Fists" turned out to be lackluster because of several things. Most blatant would be the haphazard narrative style it takes. The film never felt cohesive and at times even confusing (for one with a simple story). It definitely had a tendency to never explain things fully replacing it with choreographed action instead. The film also had a lackluster lead with RZA as the man with the iron fists. The supporting cast had more presence than RZA to be honest and how we wished another actor played the part. RZA's quiet, solemn demeanor confuses and never really works. Another problem we saw with the film is it was badly-edited and the visual effects were B-movie grade at times. Although the film may have beautiful and elaborate choreographed fight scenes, it is really the only positive thing it can offer audiences.